There are several types of ants in the UK that sting and bite people and while they’re not usually harmful, in some cases you may experience itching, swelling and pain. If you’ve been bitten by an ant and your symptoms are severe, or you’re worried that an infection might have set in - speak to a doctor online now. Our GPs can examine the affected area, diagnose whether the bite needs treatment and if needed, prescribe medication to relieve your symptoms or antibiotics to treat an infection. Why do ants bite people? While the black garden ant, the most common type in the UK, doesn’t bite or sting, there are several species that do. Unlike other species of insects, ants don’t feed on people, but may be provoked into attacking in self-defense or if they think their colony is in danger. Depending on the species, they may attack with stingers or use their powerful mouthparts to bite you and spray formic acid into the wound, which can be very painful. Ant bites and stings are usually harmless, however, the wound may cause pain, swelling and be very itchy. As with any wound, there is the danger of infection setting in, especially if you scratch it too much. 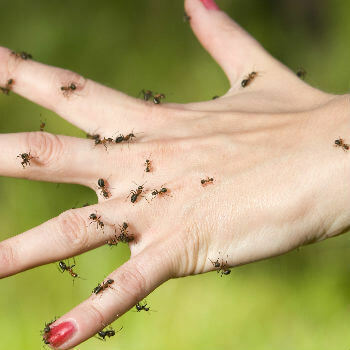 Allergic reactions to ant bites are rare, but if you experience dizzy spells, swelling in other parts of your body or nausea after being bitten - you should seek emergency medical assistance as soon as possible. If you’ve been bitten by an ant and your symptoms are severe, or you’re worried than an infection may have set in, don’t delay - speak to a doctor online right now. Our GPs can examine the bite, advise on whether treatment may be necessary and if needed, prescribe medication to relieve your symptoms or antibiotics to treat infections.